Apple's Find Friends App - Do you use it? I didn't really start using Apple's Find Friends App until a couple of years ago, when I was traveling with a bunch of friends. The majority of this particular group are Apple users, and we all decided to connect via Find Friends, so that we could find each other easily on our trip. Since then, I've connected with a few family members and my husband, just to be able to find each other when necessary. Fast Forward to this morning: one of my friends from that trip over two years ago emailed me from her office, saying: "Hey Annie, I THINK I left my cell phone home this morning, but don’t want to run home at lunch if I left it somewhere else. Can you check and see if it shows up at my house?" So I checked, and it showed up, but not at her house. I emailed her back and said "Hate to tell you this, but it shows you on Kemper Road.... is that where you are?" She emailed me back and confirmed that it was where she was, but she had torn apart her purse, looked between the seats of her van, etc.. and couldn't find it. So I emailed her back and said, sit tight, I'll call your phone. After 3 rings, she answered, somewhat sheepishly. Rather than sticking her phone in her purse, she had stuck it in the outer pocket of her lunch bag!!! It had been with her the entire time! She was so relieved, and begged me to never delete her from Apple's Find Friends App!!! I promised her I wouldn't!!! And I also have to remind her out to use find my iPhone as well, in case she couldn't get ahold of me! Last edited by Annie_8plus; 06-20-2018 at 02:06 PM. aximtreo, Tartarus and nikkisharif like this. I follow my parents, my nephew and one friend on Find Friends. My parents out of convenience and my nephew partially for security reasons. And that friend because I added him to show him and never removed each other after that. He actually one time showed up where I was because he was in the neighborhood and we had coffee. Annie_8plus, aximtreo and nikkisharif like this. I think it's awesome you're able to follow your parents. I hear stories every day about elderly people getting lost. If they had an iPhone with them, and it Find Friends or Find my iPhone was set up, it would be so easy to find them... kids too for that matter! Last edited by Annie_8plus; 06-20-2018 at 12:47 PM. I think it's awesome you're able to follow your parents. I hear stories every day about elderly people getting lost. If they had an iPhone with them, and it Find Friends or Find my iPhone was set up, it would be so easy to find them. They’re just 60. My mother may be home for most of the time but my father is quite active and he doesn’t like it when I call him and ask where he is. So to still be able to know where he is, I follow him on Find Friends instead. A few years ago we were at a very large farmers market and got separated. Even if he would have told me where he was I wouldn’t be able to find him. Find Friends was really handy that day. Since I just turned 60 I definitely agree that 60 is not old! DMP89145, aximtreo, nikkisharif and 2 others like this. Myself, the wife and son use it. Yes we use it in my family, comes in handy when out shopping or on vacation. No. I don’t use it at all. Never have and, more than likely, never will. I have my wife and kids on it. Nobody else in the world needs to know where I am around the clock. Tartarus, aximtreo and Annie_8plus like this. My family and I don’t use it. Nope, never saw a need. How does this compare to Find My iPhone ? The wife and I do family sharing, so we use Find My iPhone to see where the other is. You don’t need the login credentials for your friends to follow them. They only have to accept the follow request once and that’s it. A little off topic here but has anyone ever gotten an inappropriate request on Find My Friends? For example, I once got an awkward request from a former colleague. nikkisharif and Rob Phillips like this. I'm happy to say I never have... and that would be a bit disconcerting. I think that FMF is great in the right circumstances. I think users should be careful on who they connect with! I think users should be careful on who they connect with! I don’t use it, won’t use it.Nobody needs to know where I am, I may be behind you. I don't use Find My Friends. Not yet anyway. I did use Find My iPhone while at the hospital. My sister in law lost her iPhone, so I used Find My iPhone to locate it. She was hysterical, thinking she left it in a taxi. But it showed she left it at home. I use the Find My Family app some. The app store link doesn't work for this app. That Find My Family app is exactly the same idea as the Find Friends app plus some extra features. But it may be cross-platform, unlike Apple’s app. I don't use it. I have everyone important to me in Life 360. All of us know where each of us is at any time. I can even see how fast someone is driving. We check in with one another, and there is a panic button in case anyone is in trouble. The app shows on the map where every hospital, police department, and fire department are located. It also shows where convicted child predators live. The app itself will call 911 if you are in a car accident, and also auto calls everyone in your family circle that uses the app. I've been using this app since back in my Android days, so many years. 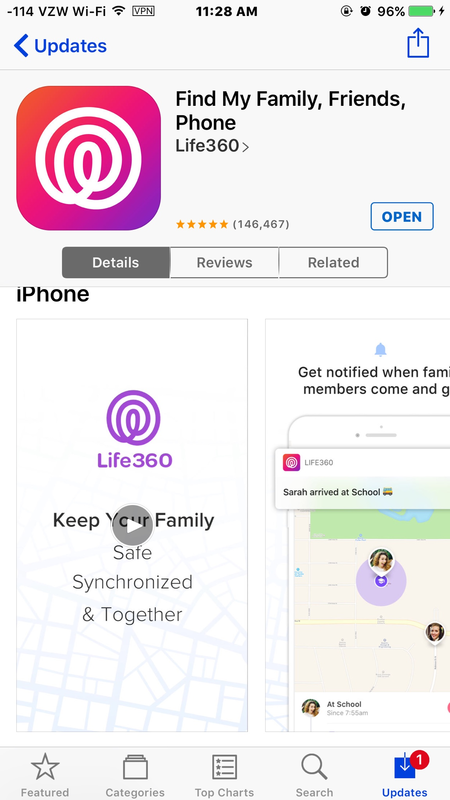 We use Life 360 too because my cousin made a family group for us. There are a couple of people that have Samsung devices, so this works perfectly!! I’ve never used Find My Friends, though. Annie_8plus, Ledsteplin and Sherry_B like this. There are a lot of apps related to friends on app store. Is there any new features present in this app which are not available in others. Will Apple introduce the Apple Watch Series 4 this Fall?